We celebrate Yule here in the Northern Hemisphere on Sunday December 21st, the Southern Hemisphere will be celebrating Litha. Nice!!! I bet you'll have a great time..... maybe you should share your ceremony with us.... if you don't want to post pics, then take us through it... perhaps? I can do better than that lol, will post the actual ceremony for any that might be interested in reading it, it is only a short ceremony. Altar: The altar should have an image of the God and Goddess with an incense burner placed in front of the images. Two white altar candles, a special candle to symbolize fire and light, a little bell, goblet with wine/juice, a small dish of cakes or cookies, holly, mistletoe etc. When everyone is ready the participants should assemble in the circle area, all join hands. Priestess: Let it be known that the Circle is about to be cast, let none be here but of their own free will. Purify and cast the Circle but do not light the special candle. All let go of hands. The Sun God who is the bringer of the life of Spring and the promise of Summer. We call the Sun from the womb of night. Blessed Be. Calling the quarters, all face East. East: Lords of the Watchtowers of the East, we summon, awaken and call you up to guard the circle and protect us in our rite. Come to us now on the cold winter wind and breathe into us the spirit of the pure joy of life. So mote it be! South: Lords of the Watchtowers of the South, we summon, awaken and call you up to guard the circle and protect us in our rite. Come forth from the fires that warm this winter's night. Kindle within us the warmth of spiritual awakening. So mote it be! West: Lords of the Watchtowers of the West, we summon, awaken and call you up to guard the circle and protect us in our rite. 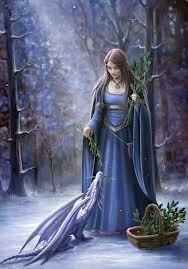 Come forth from the frozen streams, from the driven snow. Bring us the water of life to wash away our fears and resentments that we may find peace of mind. So mote it be! and nourish us so that our faith may grow in strength. So mote it be! The priestess then takes the wand, and starting at the north, draws it along the entire circle clockwise back to the north point. Priestess: The circle is sealed, and all herein are totally and completely apart from the outside world, that we may glorify the Lady whom we adore. Blessed Be! Priestess 2: To die and be reborn, the wheel is turning, what must you lose to the night? Priestess 2: Fear is lost to the night. Fear is lost to the night. To die and be reborn, the wheel is turning, what must you lose to the night? All: The light was born, and the light has died. Priestess 2: Everything passes, all fades away. Priestess: You are entering a space of perfect freedom. As everyone visualizes their hopes for their new life to come with the coming of the Sun. All: We are awake in the night! We turn the Wheel, to bring the light! We call the sun from the womb of night! Priestess 2: He sets his face to the West, but in the East arises! Priestess: Queen of the sun! Queen of the Moon! Queen of the horns! Queen of the fires! Bring to us the Child of Promise! It is the Lord of Life, who is born again! When the sun comes up again! Priestess: Golden sun, of hill and field, Light the earth! Light the skies! Light the waters! All: Io! Evohe! Io! Evohe! The Sun Child steps forward towards the altar. Sun Child: I am the returning light, the returning sun, bringing light to the darkness. The Sun Child lights the special candle. All: I who have died am alive again today, the Sun is born again! This is the birth of life and love and wings, we are born again, we shall live again! The Sun Child, the Winter born King! All: The Dark God has passed the Gate, He has been reborn through the Mother, With Him we are each reborn! The tide has turned! The light will come again! In a new dawn, in a new day, The sun is rising! Io! Evohe! Blessed Be! The goblet bearer now faces the altar and takes the goblet, raising it and offering it to the Lady and the Lord. Goblet bearer: We give thanks to the Gods for that which sustains us. The cake bearer, also facing the altar, takes the plate of cakes, raising it and offering it to the Lady and the Lord. Cake bearer: We give thanks to the Gods for that which sustains us. All: So be it. May we ever be aware of all that we owe to the Gods. Priestess: Eat and drink. Be happy. Share and give thanks. So Mote It Be. East: Lords of the watchtowers of the East, return now to the brisk winter winds which are brimming with the excitement of the year's climax. Take with you our blessings and thanks. Hail and farewell! South: Lords of the Watchtowers of the South, return now to the fires of the winter hearth. Take with you our blessings and thanks. Hail and farewell! West: Lords of the Watchtowers of the West, return now to the frozen streams and snow fields. Take with you our blessings and thanks. Hail and farewell! North: Lords of the Watchtowers of the North, return now to the Earth where seeds nestle awaiting the warmth of Spring. Take with you our blessings and thanks. Hail and farewell! meet on our separate ways. Law, Love is the Bond, Merry did we meet, merry do we part; and merry will we meet again. Our rite draws to its end. Be with each of us as we depart. The circle is open but not broken! Be always in your heart. Stark, ever though about going to Boom or Ozora?